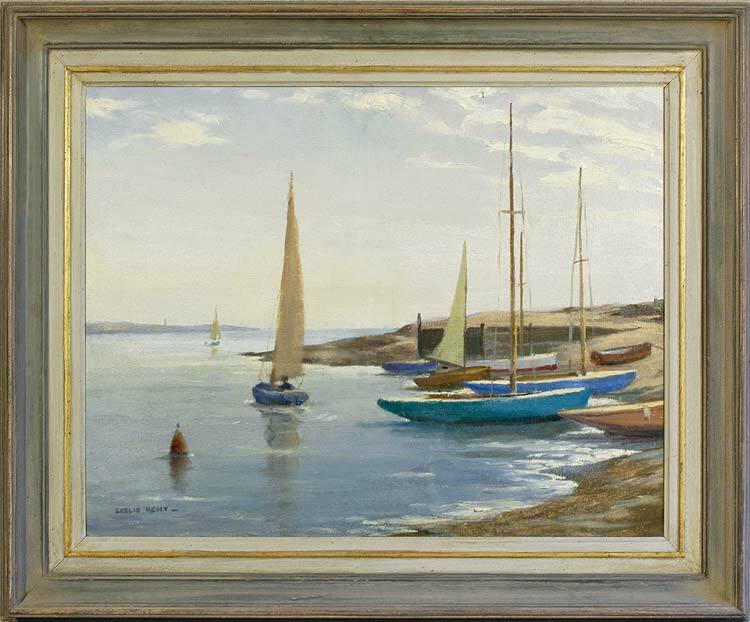 A colourful study of beached and sailing boats bathed in the golden light of late afternoon, this canvas is typical of Kent’s work. Primarily a painter of coasts and seascapes, he was adept at describing the movement of choppy water, mimicking its translucence and reflective qualities, and reproducing in graphic painterly strokes effects of cloud against the sky. His compositions are often complex arrangements of form and tone, belying their apparent simplicity. He also painted landscapes, in which the panoramic sweep and muted greens appear to have an affinity with railway and Shell posters of the 1920s and ’30s. Leslie Kent (1890-1980) was educated at Leeds University, and then from 1918-20 studied with Frederick Milner (1863-1939) in the artists’ colony at St Ives. Presumably it was from Milner that he learnt to depict the transparency of water, and the ephemeral effects of weather and light with such facility. Kent exhibited at the Royal Academy, the New English Art Club, the Royal Society of British Artists, Royal Institute of Oil Painters, the Royal Scottish Academy and the Paris Salon. Works in public collections include At Keyhaven, Hampshire (Cornwall, National Maritime Museum).